ESIC Delhi Recruitment 2019 - Below are various recruitment notifications published by Employee's State Insurance Corporation (ESIC), Delhi. As of now, we don't have any active recruitment notification by ESIC Delhi featured here. We may update as soon as the organization announces a new job notification. If you are looking for any information related to previously organized recruitment drives by ESIC Delhi, you can browse through previous job notifications mentioned below and get the new updates or information you are looking for. ESIC Delhi Recruitment 2019 - Apply Online for 96 Stenographer & UDC Posts - Directorate (Medical) Delhi Region / Office in ESIC Delhi, Delhi on Direct Recruitment. Online Applications are invited by Employee's State Insurance Corporation (ESIC), Delhi from 16 Mar 2019 to 15 Apr 2019 for 67 vacancies. ESIC Delhi Recruitment 2019 - Apply Online for 96 Stenographer & UDC Posts - Headquarters’ Office in ESIC Delhi, Delhi on Direct Recruitment. Online Applications are invited by Employee's State Insurance Corporation (ESIC), Delhi from 16 Mar 2019 to 15 Apr 2019 for 40 vacancies. ESIC Delhi Recruitment 2019 - Apply Online for 96 Stenographer & UDC Posts - Delhi Region in ESIC Delhi, Delhi on Direct Recruitment. Online Applications are invited by Employee's State Insurance Corporation (ESIC), Delhi from 16 Mar 2019 to 15 Apr 2019 for 96 vacancies. ESIC Delhi Recruitment 2019 - Job notification for Teaching Faculty Posts in ESIC Delhi, Delhi on Contract Basis. Applications are invited by Employee's State Insurance Corporation (ESIC), Delhi on or before 12 Mar 2019 for 9 vacancies. ESIC Delhi Recruitment 2019 - Walk in for 25 Specialist, Sr Resident Posts in ESIC Delhi, Delhi on Contract Basis. Candidates are invited by Employee's State Insurance Corporation (ESIC), Delhi to attend walk-in-interview to be held on 30 Jan 2019 09:00 AM for 25 vacancies. 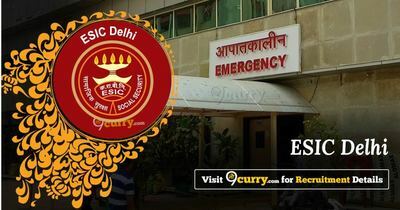 ESIC Delhi Recruitment 2019 - Walk in for 20 Sr Resident & Specialist Posts in ESIC Delhi, New Delhi. Candidates are invited by Employee's State Insurance Corporation (ESIC), Delhi to attend walk-in-interview to be held on 22 Jan 2019 for 20 vacancies. ESIC Delhi Recruitment 2019 - Job notification for Internship Posts in ESIC Delhi, New Delhi on Contract Basis. Applications are invited by Employee's State Insurance Corporation (ESIC), Delhi on or before 14 Jan 2019 till 03:00 PM and Interview to be held on 16 Jan 2019 at 09:00 AM for 4 vacancies. ESIC Delhi Recruitment 2018 - Job notification for 329 Specialists Posts in ESIC Delhi, Delhi, Gujarat, Haryana, Himachal Pradesh, Karnataka, Kerala, Madhya Pradesh, Maharashtra, Punjab, Rajasthan, Tamil Nadu, Uttar Pradesh, West Bengal, Assam, Bihar, Chandigarh on Direct Recruitment. Applications are invited by Employee's State Insurance Corporation (ESIC), Delhi on or before 24 Jan 2019 for 329 vacancies. ESIC Delhi Recruitment 2018 - Apply Online for 306 Staff Nurse, Pharmacist & Other Posts in ESIC Delhi, Delhi on Regular Basis. Online Applications are invited by Employee's State Insurance Corporation (ESIC), Delhi from 21 Dec 2018 to 21 Jan 2019 for 306 vacancies. ESIC Delhi Recruitment 2018 - Walk in interview for 64 Senior Resident Posts in ESIC Delhi on Tenure/ Contract Basis. Candidates are invited by Employee's State Insurance Corporation (ESIC), Delhi to attend walk-in-interview to be held on 18 Dec 2018 for 64 vacancies.